I’ve been making (photographing, sketching in oils, sketching in ceramics) since setting up an in-house space at Mudshark LLC, this week. Photograph (digital) of building across the street from Mudshark. Detail from a sketch in oil paint. 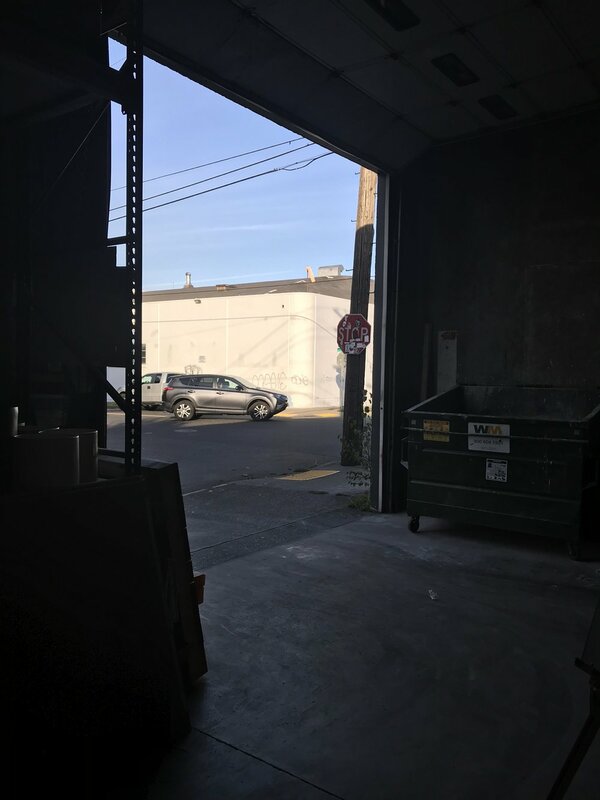 With the opportunity to work in a production house in downtown Portland, I’ve realized how primary being close to the objects of my inspiration—alleyways, sidewalks, the detritus of movement on a sidewalk, and change of light on surfaces across a day—is in a sense of connection to the world I am making work about. I am deeply appreciating this opportunity to gather and make in this situation, particularly visual information, and most particularly through the open garage door of Mudshark which allows me to work in a space of transition with a sense of inside and outside at the same time. Not to mention, the inside of the building offers its own elements of inspiration and visual poetry. This intersection of spaces and atmospheres feeds the thought process and affects the choices that inform how I handle materials. I am finding a lot of inspiration as well as connection in this environment, which I think are key elements to making in a state of “flow.” I feel extremely lucky for this opportunity to be close to what is inspiring my work at this crucial moment in my thesis body of work. 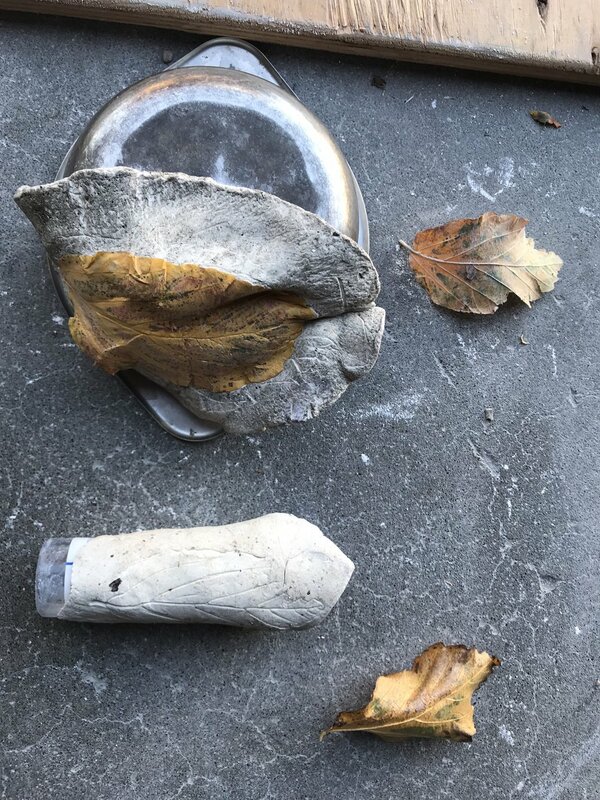 I am inspired to capture effects of light on the surfaces of buildings while realizing I have identified a core grouping of objects which relate “the city/the street.” These are objects that are mostly municipal and I have made some casts from them. The movement of traffic and work around me also contributes to a sense of energy of place as I seek out the elements of buildings I will make some pressings and pieces from. 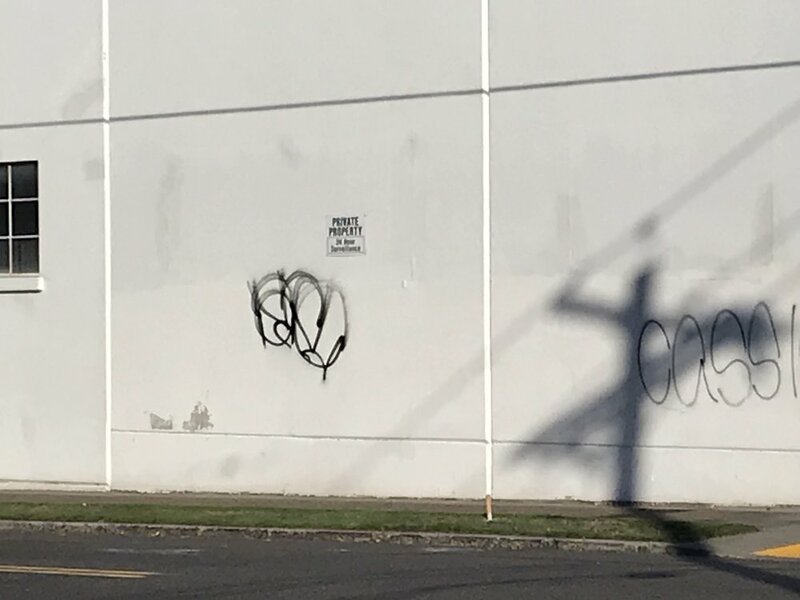 There is a sense of connection through being in the midst of this environment and activity that helps me isolate what I am sensing as crucial to making work which rings true as a reflection of this city space—what I am desiring to communicate about this space is becoming more clear through working in context with it. I am pulling small impressions in porcelain to stay active while I also size up the places and surfaces I want to make larger impressions from. 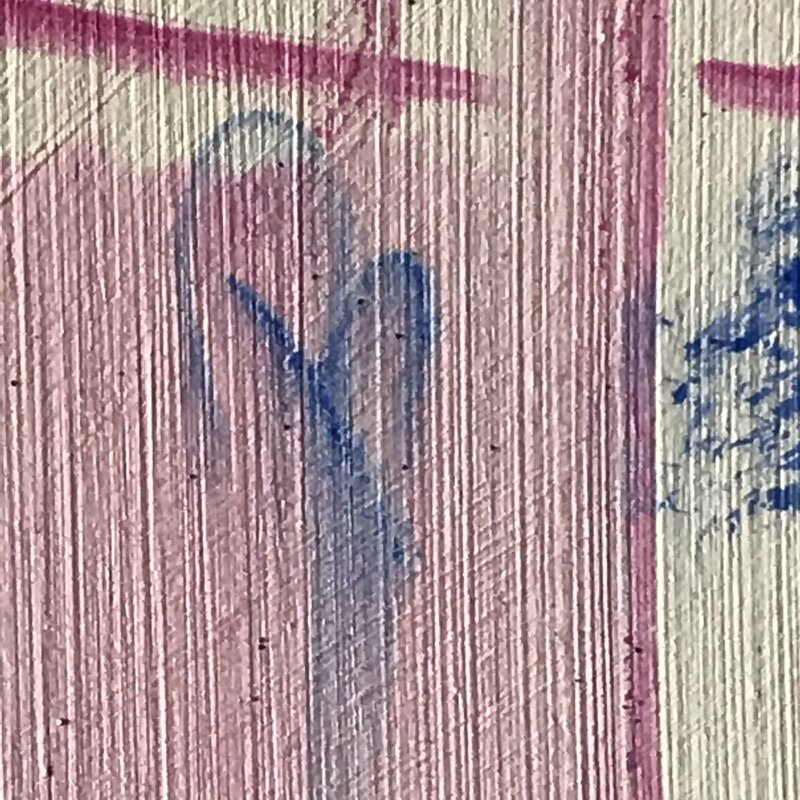 For example, after considering the Mudshark building, this unique detail captured my attention. I pressed a small piece in preparation for making a larger square or rectangular piece from this part of the building on Monday (Oct 22). I made a suite of pressings of sidewalk details and decided one of the core “street objects” I am making into larger square or rectangular panels (in addition to building pressings) will be this pedestrian safety surface. I have recognized its ubiquitous nature, it is part of every sidewalk crossing zone across Portland and has become obvious for me as an object that relates the aesthetic of “city street.” This surface will be complementary to parts of a building “figure” in composing a portrait of a part of a town. I had made pressings from this surface in stoneware, before, and the porcelain makes a more finely detailed impression. “[T]runcated domes and detectible warning pavers,” are a part of “tactile paving” (meaning: paving that can be felt). It helps the visually impaired detect when they are about to leave the sidewalk and enter the street. 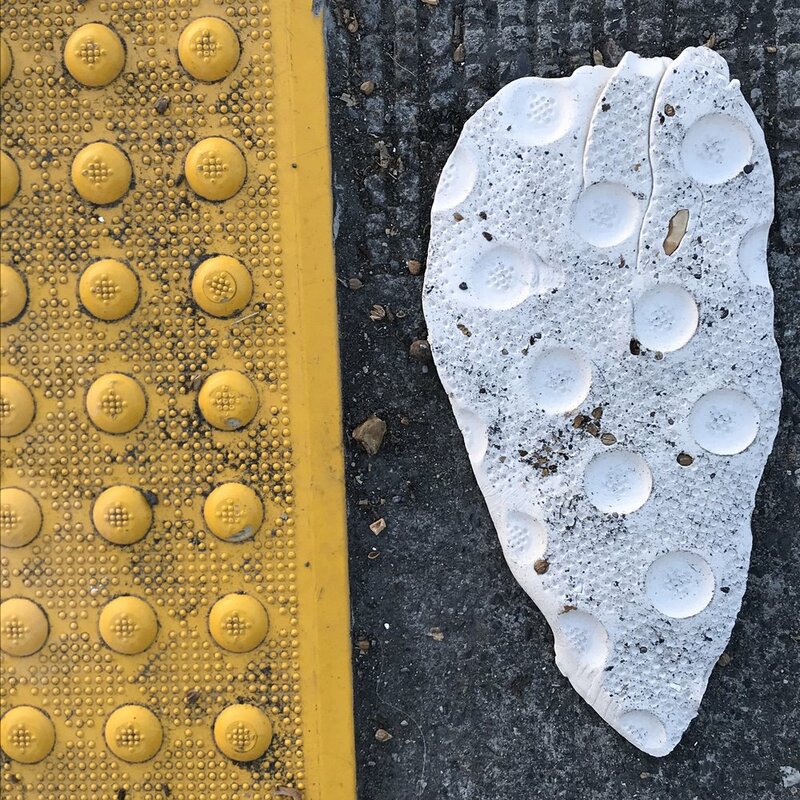 This discovery has elevated the meaning of this surface for my work: as a transitional phase signal, it seems appropriately symbolic for what I am looking at and observing and thinking about with spaces of transition and change in a cityscape. Although it is an aspect of the modern American street aesthetic and I have been looking at reproducing elements that relate historical eras, this gives me an opportunity to relate to the modern viewer’s sense of “street environment” while also commenting on the aspect of design as relating a particular moment in time or history. As my sense of the opportunities of working in this space crystallizes, I only hope I can make with the vigor and speed I will need to make full use of every moment of this opportunity—the two weeks I have remaining seem hardly enough for the moments of discovery I have had in such a short time working in situ. I have also been working out how to edge these pieces, based on response to what I have made in studio at OCAC. I am working out how a “proper” or “manhandled” edge reads compared to a torn, ripped or slumped edge and which adds to the vocabulary of my work.